This county was formed in 1859 from a portion of Ashe County and derives its name from the mountains in which it is situated. It borders on the State of Virginia. 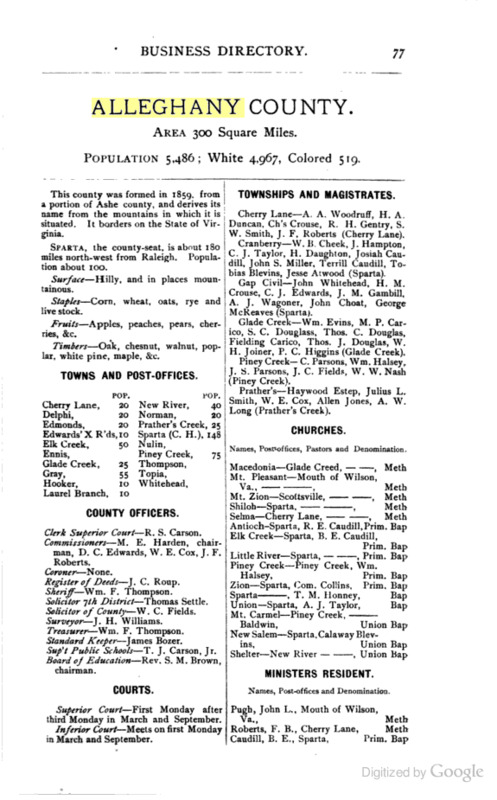 Sparta, the county seat, is about 180 miles northwest from Raleigh. Population about 100. Surface -- Hilly and in places mountainous. Staples -- Corn, wheat, oats, rye and livestock. Fruits -- Apples, peaches, pears, cherries. Timbers -- Oak, chestnut, walnut, poplar, white pine, maple. Clerk Superior Court -- R. S. Carson. Commissioners -- M. E. Harden, chairman, D. C. Edwards, W. E. Cox, J. F. Roberts. 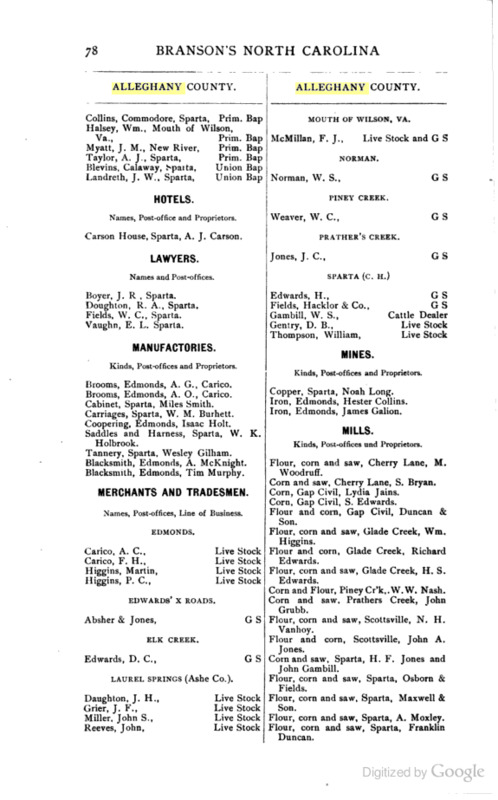 Register of Deeds -- J. C. Roup. Sheriff -- William F. Thompson. Solicitor 7th District -- Thomas Settle. Solicitor of County -- W. C. Fields. Surveyor -- J. H. Williams. Treasurer -- William F. Thompson. Standard Keeper -- James Bozer. Sup't Public Schools -- T. J. Carson, Jr.
Board of Education -- Rev. S. M. Brown, chairman. Superior Court -- First Monday after third Monday in March and September. Inferior Court -- Meets on first Monday in March and September. Names, Post offices, Pastors and Denomination. Names, Post offices and Denomination. Carson House, Sparta, A. J. Carson. Boyer, J. R , Sparta. Brooms, Edmonds, A. G., Carico. Brooms, Edmonds, A. O., Carico. Carriages, Sparta, W. M. Burhett. Saddles and Harness, Sparta, W. K. Holbrook. Names, Post-offices, Line of Business. Flour, com and saw, Cherry Lane, M. Woodruff. Corn and saw, Cherry Lane, S. Bryan. Corn, Gap Civil, Lydia Jains. Corn, Gap Civil, S. Edwards. Flour and corn, Gap Civil, Duncan & Son. Flour, corn and saw, Glade Creek, Wm. Higgins. Flour and corn. Glade Creek, Richard Edwards. Flour, corn and saw, Glade Creek, H. S. Edwards. Corn and Flour, Piney Cr'k,.W.W. Nash. Corn and saw. Prattlers Creek, John Grubb. Flour, corn and saw, Scottsville, N. H. Van hoy. Flour and corn, Scottsville, John A. Jones. Corn and saw, Sparta, H. F. Jones and John Gambill. Flour, corn and saw, Sparta, Osborn & Fields. Flour, corn and saw, Sparta, Maxwell & Son. Flour, corn and saw, Sparta, A. Moxley. Flour, corn and saw, Sparta, Franklin Duncan. Smith, John 1. . Sparta. 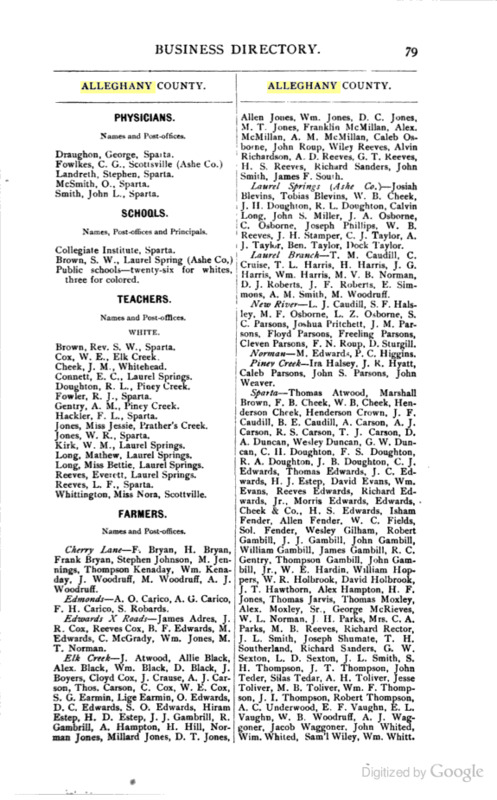 Public schools -- twenty-six for whites, three for colored. Brown, Rev. S. W., Sparla. Cox, W. E., Elk Creek. Connett, E. C., Laurel Springs. Doughton, R. L., Piney Creek. Gentry, A. M., Piney Creek. Kirk, W. M., Laurel Springs. Long, Mat lie vr, Laurel Springs. Long, Miss Bettie. Laurel Springs. Cherry Lane—F. Bryan, H. Bryan, Frank Bryan, Stephen Johnson, M. Jennings, Thompson Kenaday, Wm. Kenaday, J. Woodruff, M. Woodruff, A. J. Woodruff. Edmonds—A. O. Carico, A. G. Carico, F. H. Carico, S. Robards. Edwards Cross Roads—James Adres, J. R. Cox, Reeves Cox. B. F. Edwards, M. Edwards, C. McGrady, Wm. Jones, M. T. Norman. Elk Creek—}. Atwood, AlIie Black. Alex. Black, Wm. Black, D. Black, J. Boyers, Cloyd Cox, J. Crause, A. J. Carson, Thos. Carson, C. Cox, W. E. Cox, S. G. Earmin, Lige Earmin, O. Edwards, D. C. Edwards, S. O. Edwards, Hiram Estep, H. D. Estep, J. J. Gambrill, R. Gambrill, A. Hampton, H. Hill, Norman Jones, Millard Jones, D. T. Jones, Allen Jones, Wm. Jones, D. C. Jones, M. T. Jones, Franklin McMillan. Alex. McMillan, A. M. McMillan, Caleb Osborne, John Roup, Wiley Reeves. Alvin Richardson, A. D. Reeves, G. T. Keeves, H. S. Reeves, Richard Sanders, John Smith, James F. South. Laurel Springs (Ashe County)—Josiah Blevins, Tobias Blevins, W. B. Cheek, J. H. Doughton, R. L. Doughton, Calvin Long, John S. Miller, J. A. Osborne, C. Osborne. Joseph Phillips, W. B. Reeves, J. H. Stamper, C. J. Taylor, A. J. Taylor, Ben. Taylor, Dock Taylor. Laurel Branch—T. M. Caudill, C. Cruise, T. L. Harris, H. Harris, J. G. Harris, Wm. Harris, M. V. B. Norman, D. J. Roberts. J. F. Roberis. E. Simmons, A. M. Smith, M. Woodruff. New River— L. J. Caudill, S. F. Halsley, M. F. Osborne, L. Z. Osborne, S. C. Paisons, Joshua Pritchett, J. M. Parsons. Floyd Parsons, Freeling Parsons, Cleven Parsons, F. N. Roup, D. Sturgill. Norman—M. Edwards P. C. Higgins. Piney Creek—Ira Halsey, J. K. Hyatt, Caleb Parsons. John S. Parsons, John Weaver. Sparta—Thomas Atwood, Marshall Brown. F. B. Cheek, W. B, Cheek, Henderson Cheek, Henderson Crown, J. F. Caudill, B. E. Caudill, A. Carson, A. J. Carson. R. S. Carson, T. J. Carson, D. A. Duncan, Wesley Duncan, G. W. Duncan, C. H. Doughton. F. S. Doughton, R. A. Doughton, J. B. Doughton, C. J. i Edwards, Thomas Edwards, J. C. Edwards, H. J. Estep, David Evans, Wm. Evans, Reeves Edwards, Richard Edwards. Jr., Morris Edwards, Edwards, Cheek & Co., H. S. Edwards, Isham Fender, Allen Fender, W. C. Fields, Sol. Fender, Wesley Gilham, Robert Gambill, J. J. Gambill, John Gambill, William Gambill, James Gambill, R. C. Gentry, Thompson Gambill, John Gambill, Jr., W. E. Hardin. William Hoppers, W. R. Holbrook, David Holbrook, J. T. Hawthorn, Alex Hampton, H. F. Jones, Thomas Jarvis, Thomas Moxley, Alex. Moxley, Sr., George McRieves, W. L. Norman. J. H. Parks, Mrs. C. A. Parks, M. B. Reeves, Richard Rector, J. L. Smith, Joseph Shumate, T. H. Southerland, Richard Senders. G. W. Sexton, L. D. Sexton, J. L. Smith, S. H. Thompson, J. T. Thompson, John Teder, Silas Tedar. A. H. Toliver, Jesse Toliver, M. B. Toliver, Wm. F. Thompson, J. I. Thompson, Robert Thompson, A. C. Underwood, E. F. Vaughn, E. L. Vaughn, W. B. Woodruff, A. J. Waggoner, Jacob Waggoner, John Whited, Wim. Whited, Sam'l Wiley, Wm. Whitt.